Coalatree Organics welcomes Ryan Spencer to their skate team. Get to know Spence by checking him on the Coalatree team page too. Dakota catches a stale one at PV Park. In this episode of the Tum Yeto Show, the bros terrorize the streets filming for Toy Machine's video Brainwash and Foundation Skateboard's WTF! Watch behind the scenes footy of Leo Romero, Danile Lutheran, Dakota Servold, Taylor Smith, Matt Bennett and more. Backit! Tum Yeto Show only on Ride Channel!!! 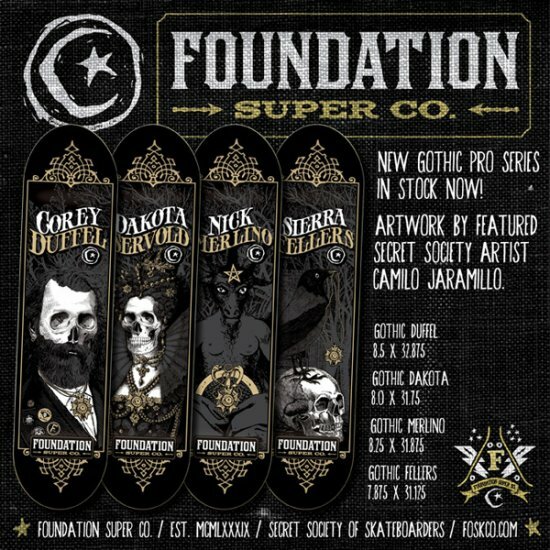 The "GOTH" pro series artwork is done by featured Secret Society artist Camilo Jaramillo. Corey Duffel, Dakota Servold, Nick Merlino, and Sierra Fellers. Heavy gap to back 5-0 for Ryan Spencer's new ad the December issue of Thrasher Magazine.